2015 Road Trip #20: “Beyond All Boundaries” « Midlife Crisis Crossover! Previously on Midlife Crisis Crossover: our road trip to New Orleans continued as my wife and I spent much of Day 3 touring the National WWII Museum. Not every activity they offer involves artifacts or invites photography. For a few dollars more, guests can visit the Solomon Victory Theater and catch an exclusive viewing of Beyond All Boundaries, a 48-minute “4-D” experience designed to be thoroughly incompatible with home video. 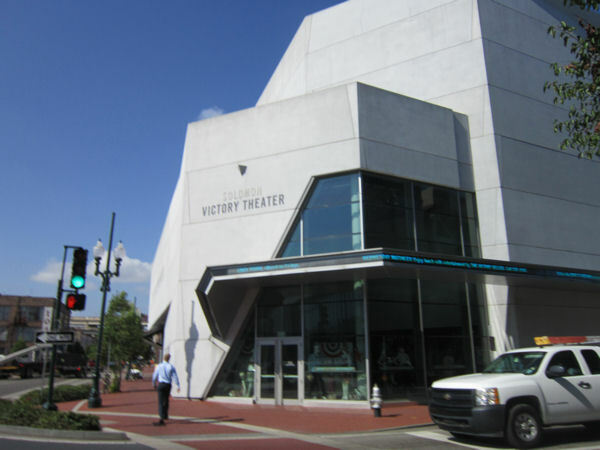 If you’re walking south on Magazine Street, take a right turn at the Solomon Victory Theater and the road will take you to the museum box office. Don’t overshoot the turnoff by two blocks like we did and sweat any more than you have to. Short version for the unfamiliar: A cast of A-list stars read excerpts from letters and essays by true soldiers and famous writers alike, all under the guidance of narrator/Executive Producer Tom Hanks. Such materials might stand tall on their own without effects, but Boundaries aims for an immersive experience. If you’ve ever been to one of those large-scale theme parks that cost happy families a fortune, you may be familiar with the kind of small theaters that turn short films into virtual rides using some combination of moving seats, 3-D glasses, solid objects outside the screen, fans blowing mist, et al. (Our family’s favorite frame of reference would be Universal Orlando’s Shrek 4-D, which we saw on our 2007 road trip.) The Solomon’s effects aren’t so frivolous, and are nowhere near as nauseating as similar contraptions we’ve endured at Kings Island. Hey, look, it’s that one actor! : Famous voice talents I recognized without peeking at the credits: Tobey Maguire, John Goodman, Neil Patrick Harris, Viola Davis, James Cromwell, Elijah Wood, and Wendell Pierce, a.k.a. Bunk from The Wire. Other voices you might know: Brad Pitt, Jesse Eisenberg, Kevin Bacon, Chris Pine, Justin Long, William Sadler, Gary Sinise, and a Jonas brother. There’s someone famous in there for every American crowd. 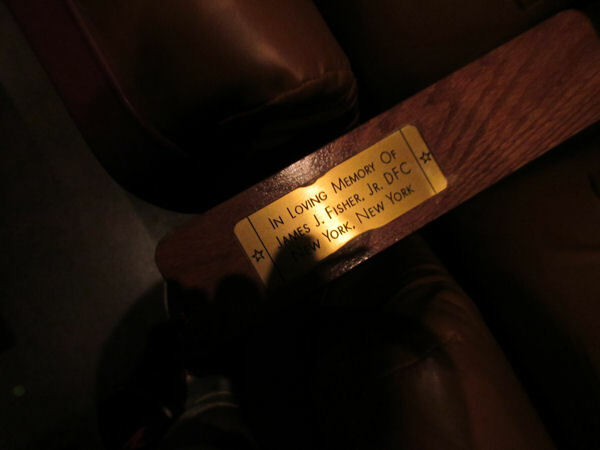 If you’re interested in giving to help fund the Theater, a donation of $5,000.00 or more would allow you to name one of its 246 seats in honor of a friend, family, or meaningful organization. Meaning or EXPLOSIONS? Viewers are first guided to a staging room with no seats, only eight vertical screens timed to show a seven-minute prologue in which Tom Hanks sets the stage with all the gravitas he knows how to muster, accompanied by reference maps and a bevy of horrifying statistics that added up to 65 million casualties worldwide. From this point forward, your jovial family vacation is checked at the door. Once all tourists are properly sobered and somber, everyone’s ushered forward into the main theater, seated in front of three large screens mounted at stop-sign angles to each other. They’re not IMAX size, but taken together their square footage is competitive. 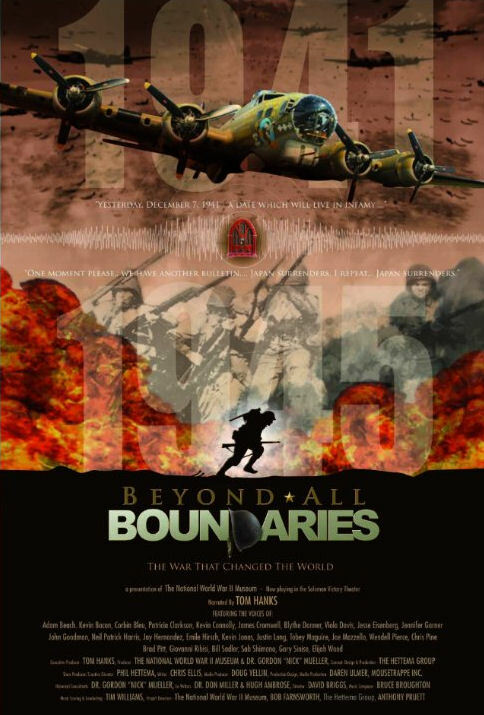 Boundaries uses some stock footage from the era leavened with newer scenes of faceless troops darkly animated and/or shrouded as the narrative barrels forward through numerous moments and battles. Hanks’ exposition alternates with excerpts from the letters of average Joes as well as from the words of Edward R. Murrow, Hoosier war journalist Ernie Pyle, cartoonist/Sergeant Bill Mauldin, and author/POW Kurt Vonnegut. Explosions and live props nonetheless rule quite a bit. Seats vibrate with the thundering of concussions and tank treadmills. Naturally there’s some light-show bedazzling not quite as blinding as real battlefield fusillades. Props come and go in various stages — some on elevating platforms up front, others descending from ceiling cables. Objects in motion include an old-time radio, simulated snowfall, a Nazi watchtower, and an entire fighter-plane cockpit. Nitpicking? I clocked the whole experience, from anteroom to exit, at 48 minutes. I’d expected twice as long, and wouldn’t have minded if they’d run three times that. I had one major problem that might not bother some of you so much. More on that in a second. So what’s to like? The film and its trappings make the firsthand experiences engrossing and at times educational, with nary a trace of schoolroom dullness. The battle scenes seem visually minimalist compared to typical war movies, but the sound design can be overwhelming, which is exactly how I like it. Imagine Saving Private Ryan cranked down from 11 to 8, without the gory intensity or a distracting Matt Damon. As of this writing, general admission to the National WWII Museum runs $14.50-$24.00 depending on your demographic. Adding Beyond All Boundaries is only an extra five bucks per person. If you’re in the area and seeing the Museum anyway, absolutely go for it. How about those end credits? 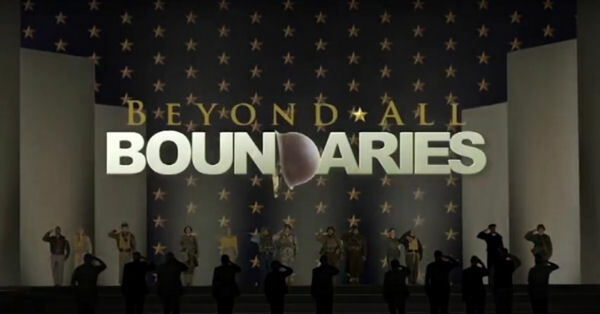 No, there’s no scene after the Beyond All Boundaries end credits because there are no end credits. At all. NONE. No cast or crew. No “Special Thanks”. No annotations for the stock footage sources. No list of locations used in shooting. No name-checking of eight thousand animators or their production babies. Not even a simple “THE END” or “THANK YOU VETERANS FOR YOUR SERVICE” or “TOM HANKS WILL RETURN IN ‘2 BEYOND 2 BOUNDARIES’.” All three screens fade to black, all props retreat, and the house lights come up and chase you out. For that effrontery I would dock the film two full letter grades if I ever felt the urge to start treating movies like schoolkids. Before we left I bought myself two books from the Museum gift shops as a reward for paying attention: a 2015 re-release of writer/artist Sam Glanzman’s autobiographical graphic-novel duology A Sailor’s Story, and journalist/film historian Mark Harris’ Five Came Back: A Story of Hollywood and the Second World War, which I just finished reading last week and may be my favorite book of the year. If names like John Ford, Frank Capra, John Huston, or William Wyler mean anything to you, Five Came Back is invaluable, powerful history for the discerning cineaste.